Didn’t I say I’d be making another of these?! I think I was just so psyched to finally make something with sleeves that I actually set to work on this second one right after completing the first (packing had to wait, I had a shirt to make!). After making the first shirt, I knew there were a few things I’d want to do differently. I told you I’m not much for patterns! 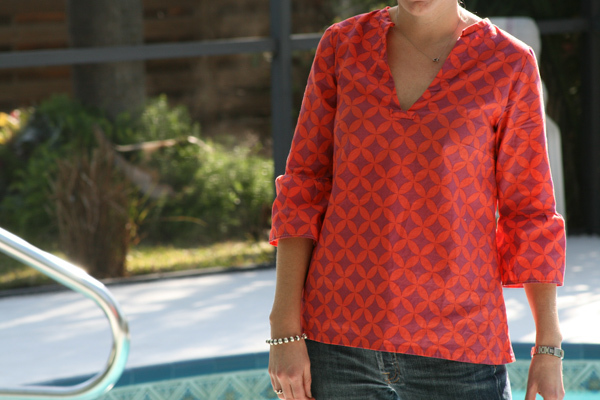 So for this one I kind of just winged it – cutting a similar shape, but without the exact pattern pieces (the true pattern for the summer blouse can be found in Heather Ross’s new book, Weekend Sewing ). I extended the length and cut it a bit smaller. I also opted for a v neck and 3/4 length sleeves. Somehow, and I really mean somehow (I was shocked myself!) it all came together almost exactly as I wanted. I used the oh so lovely older Anna Maria Horner print from her Bohemian collection, and I think this fabric is perfect for this shirt – lightweight and summery (perfect for Florida!) and in a print that I don’t mind wearing out in public! All in all, I have to say I’m in love. Everyone might get tired of seeing me in this one! This entry was posted in Clothing and tagged Add new tag, anna maria horner, Fabric, handmade, Heather Ross, summer blouse, weekend sewing. Bookmark the permalink. Wow! You did an amazing job winging it! I love the colors in the fabric. Perfect for summer. That is so cute!! It looks comfy too! It looks wonderful! Enjoy wearing it in Florida (and everywhere else). SO cute! Perfect for some hot weather in Florida and the summer in Vermont! This is going to be perfect for Florida! I love the fact that you can’t stick to patterns like me. I always have the best of intentions but somehow I always manage to put my twist on things. This looks so adorable on you! Nice job! Super cute! I could use one of those here in a few months too 🙂 I love that fabric too! Very cute. Love the sleeves. that is stunning on you! i may have to get that book. i would love a shirt like that in linen! I think the sleeves look great! I like that style, too. Like it a lot! But I’m still in love with the Swim School one though. I love that fabric. It looks great on you! I actually thought the sleeves were rolled in a wide fold in the bottom picture, which I like. Hmmmmm, might have to add this to the to-do list! Will you make one of these for me too? I love that fabric, which looks great on you. Oh man. I need to get this book and start making some clothes for the summer! This top is lovely and it just makes me want to be at a fun summer party. I’m jealous of your pool in the background. Chicago winters are NOT my cup of tea. it’s gorgeous AND it looks great on you! you are doing a spectacular jobs on those. It is not that warm here yet so those will feel just right in Florida. I just posted your summer blouse photos on my blog, weekend. They are so lovely! I am so thrilled that you were inspired to set a sleeve… twice! Your revisions to the blouse are fabulous. Would you be willing to write them up and allow me post them on my blog? I am sure lots of my readers would love to know how you did it. I can pay you in fabric or cookies. but I’m not a great baker so I would take the fabric if I were you. Really hoping you are up for it! What a great blouse! It looks fantastic!!! 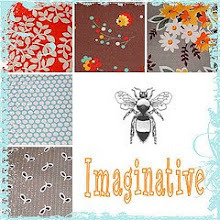 And that fabric is now recolored and part of Anna Maria’s new Good Folks fabric collection. Yay! Love, love , love the shirt. Great job! I LOVE IT!!! I think I might try sewing up one for myself… once the temperature gets above freezing! Looks great! Now I really can’t wait to get the book!!! It’s absolutely lovely and even more so considering you made it an indie-design and it came out so well. Doesn’t that feel good?! Great job. this looks great! i’m making this shirt right now, too. actually, i just have to hem the sleeves and take in the sides a bit and done! i really love your variations – i have already planned number two for myself. i hadn’t considered 3/4 length sleeves, but thanks to you, i now need them. I can’t wait to get the book! I preordered it a couple of weeks ago and it should be here next week. 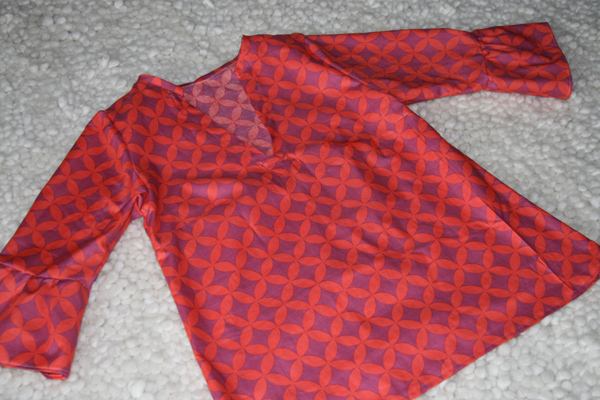 The blouse was the project I wanted to make first, and after seeing the ones you did I can hardly wait to get started! Oh and I have a question if you don’t mind. How much fabric do you need to make the blouse? I want to order some so I can start right away when the book arrives. This is awesome! I love it! And, the sleeves are lovely. I would wear it all the time too. It is so cute and flattering! You’ve single-handedly made me want Weekend Sewing! I found your site through Heather Ross’s blog and I’m so glad you did. I’ve been knitting lately more than sewing, but now that winter is winding down I’m feeling the itch to sew. Your site is really inspiring! Beautiful work! I looked for that book this weekend but was unable to find it. I guess I’ll have to order it. I hate waiting!!! Your blouse has convinced me that I NEED to go back and get that book. I was flipping through it the other day but like a dummy I didn’t buy it. D’oh! I LOVE your blouse and something like that is perfect for our Arizona climate. Thanks for sharing everything! 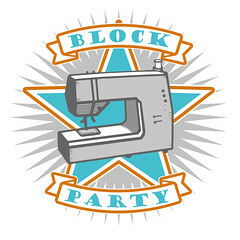 Just found your blog by googling “Heather Ross weekend sewing” and then realized I had already seen you on Heather’s blog. Love YOUR blog by the way — it’s so great to find others who are blogging about sewing like this. Love your zig-zag skirt; I too fell hard for the AMH dress on her blog. It’s so great. So “Weekend Sewing” is ordered and on its way to me in the mail but I really want to order yardage for this shirt so I’ll have it when (or slightly after) it arrives — how many yards does this shirt need? Thanks in advance if you have time to get back to me. Otherwise, Happy Sewing! Wow! I wandered over here from flickr. This looks so amazing! You’ve inspired me…. I want to try your version, and I read your instructions on Heather’s blog. I am confused about the placket though. Did you change the shape? I love it, the fabric is great and the cut of is is flattering. Great Job. I love, love, love your top. The colours, the fabric, the shape of the top everything looks perfect. I am so adding that book to my wishlist. It is gorgeous. I hope you don’t mind that I posted a picture and a link to your blog on mine. I like to share such lovely creations with others. Ashley – I love the summer blouse you made from Weekend Sewing. It has been on my list since you posted it in Feb. I was just about to get started on mine, finally. I went to read the instructions you wrote for the modifications for HR’s website. They are not there any more. Do you know where they are posted now? I absolutely love your blog. I don’t know how you get so much done, but it is very inspirational. Thank you. Is there any way you could post your revisions or publish a tutorial for this blouse? I don’t think they are posted on the Heather Ross web site anymore. Thanks!